Having opened for the VuPop Conference on June 10, Forgotten Treasures: Paper for the People: Dime Novels & [sic] Early Mass Marketing Publishing will remain on display until mid-November. Demian Katz, library Technology Development specialist, curated the exhibit. Michael Foight, Special Collections and Digital Library coordinator, and Laura Bang, Digital and Special Collections curatorial assistant, aided Katz in mounting the exhibition, which includes an online component. Falvey’s team leader for Communication and Service Promotion, Joanne Quinn, created the graphics for both the physical exhibit and its online counterpart. This presentation and the VuPop Conference were inspired by the 2012 discovery of a collection of dime novels, reprint libraries and other late-nineteenth-century printed works in Falvey Memorial Library’s basement. The collection is now housed in Special Collections where the publications are being digitized to make them available for online reading. Each group of publications is accompanied by informative texts. 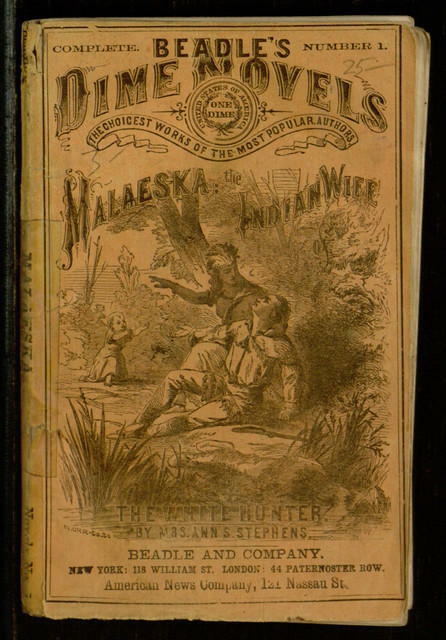 Katz tells us “The first dime novel is widely considered to be Malaeska: The Indian Wife of the White Hunter” published in1860 and reprinted circa 1864. 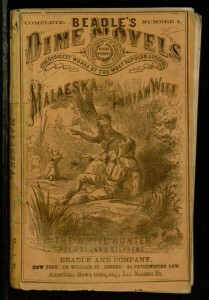 A copy of Malaeska, albeit the circa 1864 edition, is on display. Other early dime novels in the case were published from 1861 to 1887. Dime novels are primarily considered an American phenomenon, but many American titles were translated and published abroad in such locations as the Netherlands, Denmark, Italy, France and Spain, as shown in the International section. The Historical portion features a dime novel, Percy Greville: The Scout of Valley Forge (1906) by Jas (sic) A. Gordon, one of many with ties to our area. This exhibit, with its informative placards and sometimes colorful book covers, provides both visual and intellectual views of popular reading of the era circa 1860 through the early 1900s.